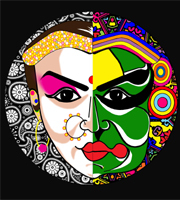 For the Second year running, Nautanki Theatre’s 2nd South Asian Festival is a celebration in South Asian languages, transcending cultures and geographical boundaries, these plays are presented by various South Asian theatre groups who have been performing plays for many years within their community space. Nautanki endeavours to provide a common performing platform for these groups, encouraging a cross-cultural and inter-language exchange. Nautanki is working along with three of these theatre groups to bring you three ‘one act’ plays over two nights. An Urdu play, ‘Jehan Ara ke Teen Roop’ (The Three Faces of Jehan Ara), a Gujarati play, ‘Bapu Downunder’ and a Sinhalese play, ‘Thara’ will be presented during the festival. Jehan Ara means the Empress of the Universe! Does every woman ruminating on her life’s journey think she has been a queen? In this short play an ageing and ailing Jehan Ara reflects upon the crests and troughs of her life. In her abysmal solitude she explores the stages of her life through the lens of memories. The colours cast back by the lens are luminous and iridescent and yet at times murky. The introspection and contemplation of one woman alone, compels you to ponder on the life of a woman, her life choices and her destiny.